A great bunch of lads having a great crack...and a lake which didn't produce. That was the three-day Terrie Tapp Memorial Furzton charity fest. Spring fishing can always be patchy, especially following a big influx of rainwater combined with yo-yo temperatures, but there is hard and then there is rock hard. That said, at least the match was anyone's right up until the final whistle...and co-organiser Pete Patton's fb page was alive with positive comment from guys wanting to come back next year. Top spot went to Joe Carrass with 17.100 kilo overall, which included five carp to around 25lb on the last day and – under festival rules – counted as only 3lb each! Mike Buchwalder thought outside the box to take second with 9.010 kilo, resorting to successfully poling for silvers while all about him were mostly failing on the feeder, and Richard Tomala had 6.410 kilo for third. Forty-five fished. But the real winner, yet again, was the chosen charity. With just ONE man chucking £500 into the pot in memory of a relative...the event raised more than £900 for Willen Hospice. JOHN Hunter and Gary Maton were among those having fun with Ashlands' carp over the weekend, while Leon Butcher was doing the same at t'Mill. CITY-trouter Dave O'Farrell and his young son shared 11 trout at Ringstead, including a 4lb brownie. ALDERS: Trevor Price 193lb, Richard Brain 161lb, Neil Hutchins 151lb. 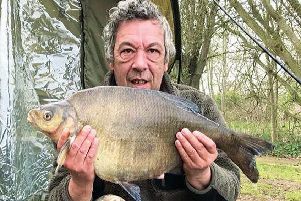 LINFORD, Cap'n Morgan canal stretch: John Hough made it two in a row when he cornered a bream shoal for 14-13. Mick Hefferon 3-3, Pete Whatley 1-1. MK Vets, Canons Ashby: Richard Lattimer 12-2, Ernie Sattler 11-8, Martin Cunniffe 11lb. TOWCESTER/Nene, Silverlake: Paul Minney 8lb, Brian Ayliffe 5-6, Mick Goodridge and Bas Eaton both 0-2. A DISPLAY of sheer dogged determination: That was John Balhatchett's performance in Towcester Vets' do on the 'short walk' cut at Heyford. Drawing what he thought was the best swim in the match he was well made up...until slipping into the oh-so-cold canal up to his chest. But, pulled out by George Cooke, he refused to quit, fishing on to win with 4-8 – and even came close to smiling as he collected the pay out. Rob Rawlins had 2-12 and Tosh Saunders 2-5.